The election is over, but Gov. 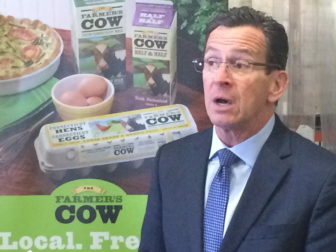 Dannel P. Malloy did a little campaigning Thursday to promote another positive monthly jobs report that he says keeps Connecticut on track to complete its post-recession job recovery next year. On a day when his administration released emergency budget cuts necessary to offset weak revenues, a reminder that the state still faces significant fiscal struggles in his fourth year as governor, the jobs report was an opportunity for Malloy to say the state still is making economic progress. Another 3,600 jobs were added in October, meaning that the state has now recovered nearly 75 percent of the 119,100 jobs lost in the aftermath of the 2008 recession. “We are making steady progress at growing our economy,” Malloy said during a press conference at Hemingway’s, a food-distribution company in Hartford that is hiring workers off the unemployment rolls, encouraged by state subsidies. His administration timed the press conference publicizing the success of Step Up, the employment subsidy program, to coincide with the release of the October jobs report. Malloy no longer has to worry about re-election to a second term, but the emergency budget cuts undercut one of the talking points that carried him through his re-election campaign. The governor said the press conference was to promote the jobs report and publicize Step Up, not offset the budget news. Hemingway’s is one of 687 companies that have added 2,743 employees through since 2012 through Step Up, a program that offers small businesses a $12,000 subsidy over six months for each unemployed worker they hire. Al Hemingway, the company’s owner, said the state provided him with qualified workers through Step Up. With the inducement of a $12,000 subsidy, he was willing to take a chance on some hard-to-place unemployed applicants, such as 64-year-old Anthony Messina, a Vietnam era vet who says his white hair seemed to discourage other employers. “There’s snow on the roof, but there’s fire in the furnace,” Messina said. Hemingway’s distributes the locally produced Farmer’s Cow brand of milk and other foodstuffs. It hired five workers through Step Up and it now is trying to fill another five jobs through the program. “It is absolutely fantastic,” Hemingway said of Step Up. His voice ragged from a cold, Malloy stood with Hemingway at the door to a refrigerated warehouse at the Hartford Regional Market to promote Step Up, one of the programs created during the bipartisan special session on jobs in late 2011. Hemingway’s has grown from four to 17 employees since the spring. Step Up, which has additional incentives to hire unemployed veterans, has helped 187 companies produce jobs for 284 veterans, according to the state Department of Labor. Step Up is available to companies that have no more than 100 employees and are located in one of the 39 cities and towns whose unemployment rate is above the state average. There is no size limit for companies who hire an unemployed veteran through the program. Susan O’Brien, the chief operating officer of Hemingway’s, said the program was easy to navigate as the state Department of Labor assigned a liaison who walked them through the application and then screened applicants. For more details, go to stepct.com.